When it comes to bags, it seems there's always a new "it bag" just around the corner and the ringleaders in identifying said bag usually come in the form of celebrities. So if that statement we made just there holds any truth at all, it's time we all stood up and took notice of the Bulgari Serpenti Handbag. This little crossbody has been seen on more Hollywood A-Listers than we can list. 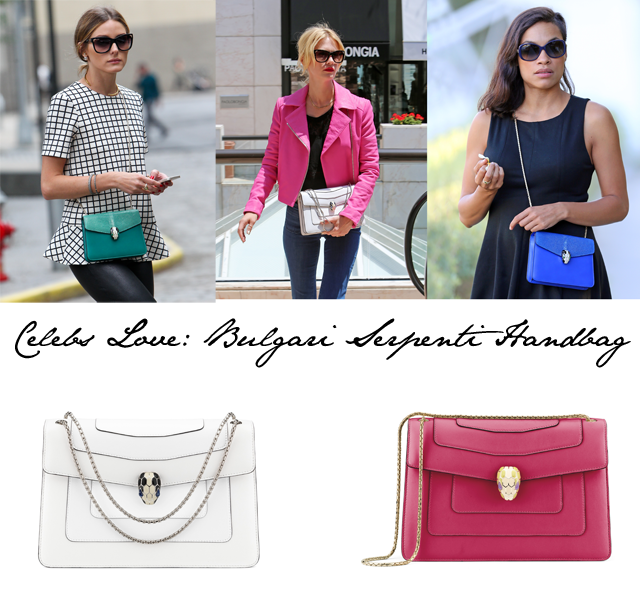 Most recently (and pictured above), we've seen Olivia Palermo, Rosario Dawson and January Jones all showing off their Bulgari Serpenti. Now, what is it that has celebrities clamoring to add this bag to their wardrobes? Well, it's hard to tell from the picture above, but this bag carries a Bulgari trademark, both in name and in decoration. The clasp for the front of the Serpenti bag is a serpent's head. Ok, it's not a real serpent's head, but a bejeweled replica that takes this bag from normal crossbody to serious style marker in seconds. Basically, if you have the cash to grab one, do it now.